Hard to see clearly but note that the throttle plate should be almost, or completely "closed" when you engage the choke. You may have to make some adjustments to the linkage to make this happen, but you do seem to be on the right track. finally got out on the water for the first time today. everything went very well. started up easily on the second pull. the killswitch that i installed worked as it should. lost power once. 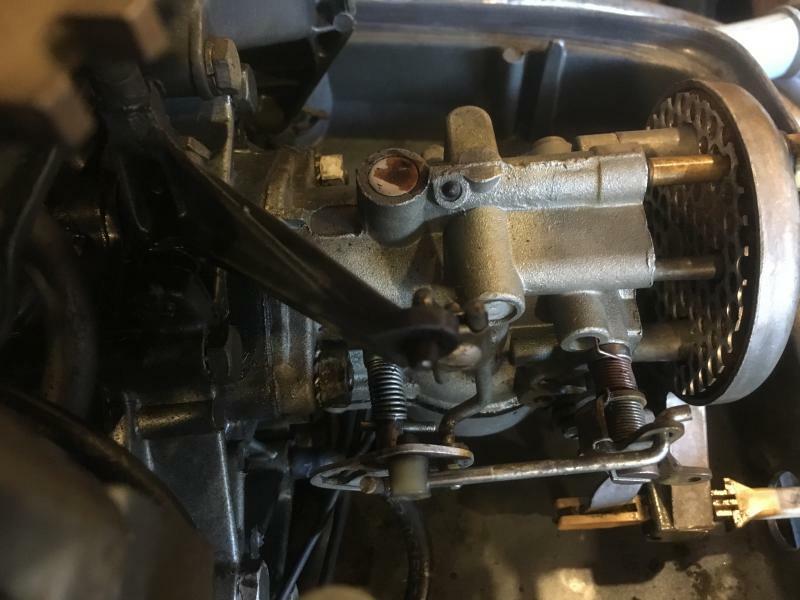 the picture is a bit out of focus, but there is a plastic piece (don't know what it is called) that is pushed into the cam follower and then connects to the throttle linkage. it popped out. i was able to put it back in and there were no problems after that. is there something that i should do to make sure that does not happen again? finally gave up trying to figure this out myself and took the motor to a marina. here is a link to a video I took of how it looks now that it is running OK. hopefully someone can learn from it down the line. You still may have a problem. If you just applied the choke to start and then took it off and immediately had a fouled plug I am guessing you will find you have either a rich low fuel/air setting or ignition problems. You stated you were going to try starting with no choke. Good luck with that. Thanks for the ideas, i will fiddle around with the mixture and see what happens. Any suggestions on how to troubleshoot the ignition that you mentioned? I would first get it running again with new plugs if it appears to be running rich idling I would reset that low speed setting. Then I would see if I had anymore issues with plug fouling. Next I would start at the points/condenser, check them for pitting and proper setting. Or just go ahead and replace them if they were not replaced when you took it to the mechanic.